Ready for Christmas? How about for Jesus’ coming this Sunday? As we prepare to celebrate Jesus’ coming at Christmas, it’s good to remember His coming in every Eucharist. Photo/khrawlings. Licensed under Creative Commons. As the holiday storm hits me again, I’ve been wondering if I spend more time getting ready for Christmas than I do all year preparing for Jesus’ coming at each Eucharist. I’m afraid Christmas probably wins. We know Advent is about preparing to celebrate Jesus’ birth in Bethlehem on Christmas. And in the pre-Advent readings we’ve reflected on His coming again at the end of time. But the Church also reminds us that the Lord is coming today and tomorrow and next Sunday at Mass. Thinking about Jesus the baby born in a stable surrounded by angels or Jesus the king coming on a cloud to save us is more exciting than reflecting on Jesus as we’re most used to seeing Him: in the form of a humble piece of bread. The Catechism tells us that in order to respond to Christ’s invitation to the Eucharist “we must prepare ourselves for so great and so holy a moment.” (CCC1385) The Church requires preparation for receiving the Lord and there are a number of other ways we can make ourselves ready both before and during Mass. Fasting from food and drink (except water) for one hour before receiving the Eucharist is another requirement. Canon law states that the elderly, the sick and their caregivers do not have to observe this fast. The Bishops offer guidelines for preparing for the Eucharist before coming to Mass, as well as right before receiving the sacrament. Seeking forgiveness daily for our sins and going regularly to confession. Jesus made the Apostles aware of the “simplicity and solemnity” of the Eucharist when He told them to prepare carefully the “large upper room” for the Last Supper, Bl. John Paul II wrote in an encyclical on the Eucharist. Preparation is thinking of the Lord and making “fervent acts of faith, hope, love and contrition,” according to EWTN television. It’s also important to approach the sacrament each time as devoutly and fervently as if it were our only communion. I’m sure Christmas wouldn’t be the same this year if we knew it was our last one. How differently would Jesus’ coming in the Eucharist this Sunday be if we considered it the same way? From the emails I have been receiving lately and my own observations out there in the world I would have to say that a lot of people are really going through some difficult times right now. The population is aging and this is impacting those who are growing older, those who are taking care of them, and those who are alone. The other day I witnessed a lady in our building who had just been dropped off by one of those handicapped vans, and even though she was not in a wheelchair herself, I could see that she had serious mobility issues. She had just returned from visiting her beloved husband and lifelong companion who was now confined to a nursing home. I had seen them out walking together a few years earlier, laughing and holding hands and thoroughly enjoying each others company. As she slowly made her way to the front of the door, she held the key in her hand ready to open the lock. And then at that precise moment she just leaned in toward the building and started to cry. I could see from the look of anguish on her weary face, that she was trying to summon the courage to enter the building, walk up the stairs, and open her apartment door, just to be alone once again for yet another evening without him. Should I go comfort her? My heart went out to her. I wanted to rush over and hug her but got the feeling to just honor her presence instead and the precious space she was in. I sensed that she was a very private person and just needed to be alone in that moment. Sometimes the moment can carry us through when we don’t have the strength to carry ourselves. I did hold her in the light in my heart and whispered a quiet prayer that somehow things would get better for her and that she would know that she is deeply loved, even though I am sure she was certainly not feeling that love right then. I think sometimes if we can simply acknowledge each others pain, without trying to fix things, then that may be the greatest gift we can give to another human being. I don’t mean wallow in the pain or focus on it, but to just acknowledge it with deep compassion, would make a huge difference to so many. We are human and pain is part of the journey. If we ever allow ourselves to love anyone or anything for that matter, pain is an integral part of the process because some day we may, probably will, lose that person, place or thing to which we have become attached, either physically, mentally or emotionally. Of course, the price of not loving, of not seeking, of not becoming involved, is a much deeper and emptier pain that strips away at our soul and destroys our spirit. Your spirit will always reach towards the love and your soul will always take the higher road. And so I would suggest that this holiday season, we answer our soul’s calling and “take the higher road” by becoming “Silent Christmas Angels” for each other, especially at this difficult time of year for so many. Christmas has a way of surfacing so many emotions and memories, some joyful and some not so joyful. So, as a “Silent Christmas Angel”, be on the look-out as to where you could shine your light on someone else’s darkness. Be constantly aware to where your wings may take you, whether it be in a busy shopping mall, a lonely sidewalk cafe, a homeless shelter, a park bench, a Christmas dinner or party. Be constantly vigil of where you could look beyond the surface to the deeper pain that may be lurking there and attend to it in whatever way and means may lie before you. Pretend you have been given a mission and are part of the “Silent Christmas Angel Invasion” of whatever city you live in or visit and it is your job to keep the home fires burning and heal the hearts and souls of those you encounter along the way. Sounds daunting? Fear not! You have at your command an arsenal of tools with which to do your work. A magic wand that you can point and shoot better than any camera will ever do and grant silent wishes to unsuspecting troubled hearts, uplifting them in the twinkling of an eye and restoring peace on earth. A big, beautiful, heart full of love, with light beams that extend from you for miles and miles ahead washing away any sadness that may appear in the distance and replacing it with joy, wonder, belief in the magic, trust in the knowing, that we are all in this together and we are truly loved. Dancing, daring, delightful Angel eyes, that dispense laughter, spread kindness, seek miracles, offer compassion, give thanks and beam these out into all the other eyes that meet yours along the way, eliciting an enchanting smile of knowing and surprised look of tender acknowledgement. And we “Silent Christmas Angels” have the ability to recognize each other. A knowing glance, a curious nod, a gentle, sweet and unsuspecting touch. A sacred salute to a comrade in arms and wings and halos. And so, dear heart, will YOU join me? Will you take your place among us? Will I sense you standing there next to me wherever I may journey? I think I already have and I know that I will, for I feel you here, reading these words, and I already recognize you. As the commercial world is already saturated with red and green, it’s easy to lose sight of the true colors of the season–the Advent season. This week the color pink represents joy. 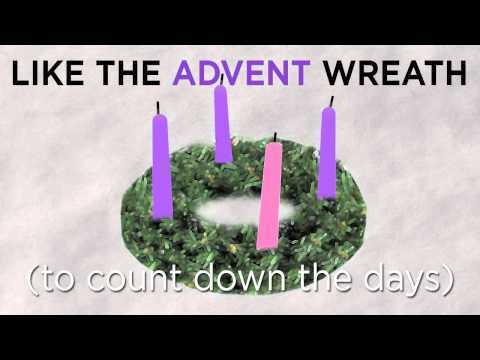 It turns out, the Church has a good reason for putting one pink candle in the Advent wreath. To discover the story of the pink candle, we first have to look at the origins of the season and the wreath. Until Advent was instituted toward the end of the fifth century, the only season Christians observed was Lent. As preparation for Christmas, the Church established Advent in the spirit of Lent–as a season of reflection and penance. The custom of the Advent wreath originated with pre-Christian Germanic peoples whose evergreen wreaths and fires signified hope in the darkness of December. Christians maintained the tradition and by the 16th century German Catholics and Protestants used the wreath to symbolize hope for Christ’s coming. The practice spread through the Christian world. By one interpretation, the wreath’s four candles represent the first Advent before Christ’s birth, with each week commemorating 1,000 years from Adam and Eve until the Nativity. Purple candles stand for prayer, penance, and sacrifices and good works done during the Advent season, as we also wait for the Lord’s second coming. Another view is that the candles in the wreath have specific names which we can reflect on as we light them and pray: the first is hope, the second peace, the third joy and the fourth love. A pink candle that signifies joy makes sense since it is lit on Gaudete Sunday–named for the entrance antiphon for that Sunday’s Mass: “Rejoice (gaudete) in the Lord always, again I say, rejoice.” The joy is subdued, however, as the penitential violet of the other weeks lessens to rose as we move closer to Christmas. As Advent is patterned in part after Lent, Gaudete Sunday is similar to the Lenten Laetare Sunday, which also represents joy and falls at the midpoint of Lent. And that finally leads to the explanation for the pink candle. In the ancient Church on Laetare Sunday in Lent, the Pope gave a citizen a pink rose. The tradition has continued, as popes bestowed golden roses on Catholic rulers and now more commonly, on places of devotion. Following the papal rose custom, bishops and priests began wearing rose-colored vestments on Laetare Sunday. The Church then brought the Lenten practice of rose vestments to Advent on Gaudete Sunday. As a result, the pink candle gained a place in the Advent wreath. Although the culture tells us it’s already Christmas, the Church reminds us through the pink candle of Advent that there is an appointed time for everything (Eccl. 3:1). The time now is for rejoicing–because the Lord is coming soon! Readers were most interested in Advent stories as we prepare for Christmas.